The mission of a regional delegation of the South Aegean to the Balearic Islands concluded the 21st May successfully, after meeting with representatives of institutional and business Spanish archipelago. For two days, organized by the Balearic Government and the Chamber of Commerce of Majorca, the Greeks learned firsthand Balearic reality, especially in tourism and technology. 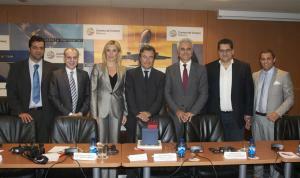 The regional president, José Ramón Bauzá; the presidential councilor, Antonio Gómez, and the president of iNSULEUR and the Chamber of Commerce of Majorca, Joan Gual de Torrella, received the South Aegean Regional Government and representatives of Hellenic Chambers of Commerce, with aimed at boosting cooperation between the two territories, both in commercial and diplomatic, and act as an insular lobby within the European Union. In this sense, the governor of South Aegean, Giannis Macheridis and Balearic President signed a cooperation agreement to defend the island needs of both territories to the EU. The delegation also met with the chairman of the Port Authority of Balearic Islands, José María Urrutia, and the CEOs of Ports and Airports and Rural and Marine Affairs, Antonio Deudero and Margaret Mercadal, respectively. Also held in the entity cameral, a round table with the participation of regional CEO Institutional and External Relations, César Pacheco, and marine industry, tourism, maritime transport, construction and engineering, environment, technological university representatives. Accompanied by General Secretary of the Chamber of Commerce of Majorca, Antoni Grimalt, Greek group visited the Balearic Technological Innovation Park (ParcBit), where they were received by the managing director of the Balearic Foundation for Innovation and Technology (FundacióBit), Miguel Bernat; Innovation coach at the same entity, Rafael Soler, and the head of the Innovation Park, Antonio Viader. The tour in the technology center’s installation included with a visit to the business incubator, the University Laboratory of animation and audiovisual technologies (LADAT - UIB) and the Microsoft Innovation Center in Tourism Technologies (MICTT). Also attended the Environmental Technology Park from Majorca (TIRME), where its CEO, Rafael Guinea, explained its operation. The mission ended with a meeting in the University of the Balearic Islands (UIB). Through this trade mission, which will be completed with the visit of a Balearic delegation to the South Aegean in the coming months, the Islands bring their experience and knowledge to developing tourism Aegean islands. Meanwhile, the Greek delegation shared with locals business development in its advanced communications and maritime transport, as well as insular policies, which have a large presence in the political agenda of the country. The institutional and business delegation was form by the Governor of the Southern Aegean Region, Giannis Macheridis; the vice Governor of Tourism, Employment, European Programs, International Cooperation and Regional Institutions, Eleftheria Ftaklaki; the opposition leader, Babis Kokkinos; the President of the Hotel Association of Rhodes, Antonis Kampourakis; the expert councilor for European Affairs of the Helen Union of Chambers, Yiorgos Assonitis; a representative of the Dodecanese Chamber of Commerce, Nikos Geronikolas, and one of the Cyclades Chamber of Commerce, Panagiotis Theodorakis.